Welcome to week three of our One Room Challenge, where we are guest participating in a challenge to transform a room in 6 (or really 5) short weeks! If you missed our previous posts, see what our room looked like before and our plans/progress here. Last week after I read through a good chunk of the other ORC Guest Participant posts, I started experiencing maximum anxiety about my time frame for this project. Having been away for 5 days took a lot of my progress time away and after seeing the strides everyone was making I was like oh crap I need to get down to business. So, as soon as I got home from the office last Thursday (and finished snuggling with #BrantleyBub) I started ripping out the telephone wire I pointed out in last week’s post. I sent out a snap of the progress I was making and immediately got a text from the hubs, like “what in God’s name have you done? !” Well it wasn’t that dramatic, but he was a little nervous curious and the text did come through pretty quick. Over the weekend, we began taking the old moldings out. We very quickly realized that we weren’t going to be able to get off so many layers of poorly applied (and like lead) paint, so we cautiously began removing them, with much concern for the plaster walls… we did not need those crumbling down on us. We plan to replace them with period appropriate moldings. It was so fun though to see the history of colors that have been on our walls from shades of green to blue to pink and white. Remember last week when I said we might do the floors, pending budget and availability of scheduling someone? Well yesterday we had the guy come out to give us the quote, because after removing the molding and revealing the edging, it quickly became apparent that it needs to be done. So we are pinching pennies and cutting from some areas of the budget where we can to make room for the floors. They will be repaired and refinished and the soonest we can get on their schedule for is May 2nd. That’s cutting it awfully close to the reveal week, but ya know what? It’ll have to do. So, flooring aside, we successfully removed all of the trim ourselves (with the exception of the window trim), and for my hubby who has never really been all that handy, and for myself who grew up in a DIY family but hasn’t ever undertaken serious projects at home (everything I plan with my clients, someone else executes), I am insanely proud of us! So right now we are in the “complete destruction” phase of the project, where nothing looks pretty and we are lucky if there isn’t still demo dust scattered around the living room (and the rest of the condo). Hopefully soon, things will start looking a lot prettier! What do you think? Are you a fan of unifying the space by painting everything including moldings the same as the wall color? This weekend our goals are to finish removing the last bit of trim, tend to the radiator, and start working on patching and priming the walls. I’d love to say we will paint, but if there is anything I’ve learned from doing the molding it’s that everything takes longer than you think, and I do not want to rush the paint! We also have an appointment for the window treatments to finalize our fabric selections and get our install scheduled. So all in all, I feel we have made great strides this week (even if it only does equal one thing off the list). Be sure to pop over and scroll through the featured designers progress updates here, and jump to the Calling It Home blog for the guest participant link up to see everyone else’s spaces as well! I hope you are having fun following along with this challenge! The color of the year announcement for each of the leading color experts in the industry is always a big time of year. it is something that we all get in a tizzy about and look forward to. This year Benjamin Moore announced the color of the year as Simply White, OC-117, and had this press release which if you have any interest in color and interiors I think both of those links are worth the read. I have to say that although many people were looking for more of a color, I’m not surprised. If you scroll through your favorite home decor Instagram account, flip through a magazine-be it modern, traditional, transitional, or otherwise, when you are looking at the decor images, you are seeing a vast array of whites. Whites in kitchens, whites in bathrooms, whites in living rooms, great rooms, and bedrooms. Whites are vastly used in commercial spaces, including boutiques, big box stores, and even restaurants; not to mention the use of white in the hospitality industry. So at the end of the day, no matter how much you love color, whether it is bold or pastel, cool or warm, white is always there. It provides a base and neutral. Not only that but it works in such myriad of spaces (as suggested above) that it makes for the best base color to work with. And if you have a crisp neutral base, then you can add almost anything in the way you layer and decorate. Your color pallet can change seasonally and you can add different colors as pops to brighten things up and add interest from time to time. One of my old professors in design college when I first started mentioned how the most common color schemes she would use were combinations of neutrals: whites, tans, grays, and then build from there, because if you have a neutral base, you can always evolve the design of the space without making major changes. Not a bad concept, although I must admit that I’m often of the mindset that it is only paint and you can always change it without too much hassle but I do understand the appeal of wanting to have a solid foundation of color that you don’t have to worry about changing. 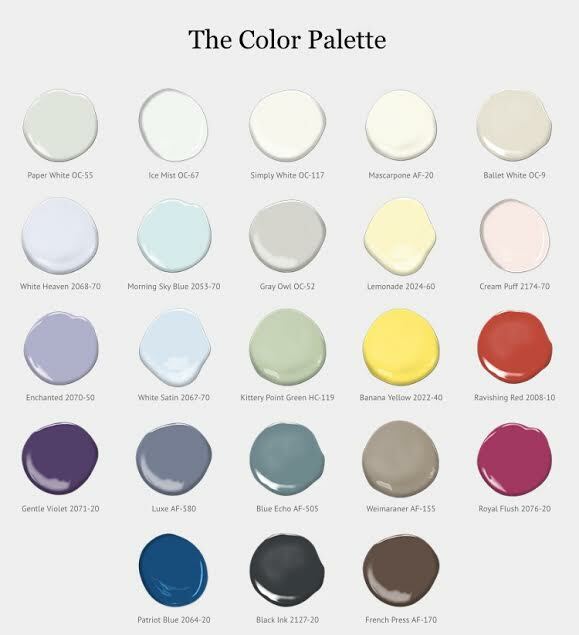 They have selected 23 colors in total, of which 8 are whites or white-based tones (Paper White, Ice Mist, Simply White, Marscapone, Ballet White, White Heaven, Cream Puff and White Satin); 7 are soft or muted, more pastel hues (Morning Sky Blue, Gray Owl, Lemonade, Enchanted, Kittery Point Green, Luxe and Weimaraner); and 8 that are more bright or bold offering a color pop or at least something with more depth (Banana Yellow, Ravishing Red, Patriotic Blue, Black Ink, French Press, Blue Echo, Gentle Violet and Royal Flush). Of all the colors in their 2016 palette, I have specified 2 of them in current or past projects and they were both of the white or white based family. What can I say, Benjamin Moore might have some inclination as to what they are doing when they talk color. Do you have any white based rooms or neutral rooms in your house? Would you use any of the 2016 color palette in your home? Every time I see the announced colors of the year I feel so inspired and start itching to re-paint our condo. We only have one room that hasn’t been painted, but I think it’s fair to say that at least one of the painted spaces could you a fresh coat. Hmm…. 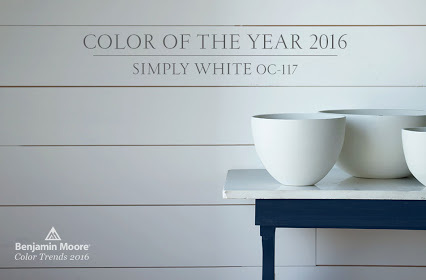 All images shared in this post are from Benjamin Moore’s website and their color of the year 2016 announcement. Links have been provided throughout the text. When it starts to get a bit cooler at night, we call that good sleeping weather: weather in which you can open the windows, maybe add another layer to your bedding and really cozy in and get a good night’s sleep. I wanted to share with you how we transition our bed for fall. 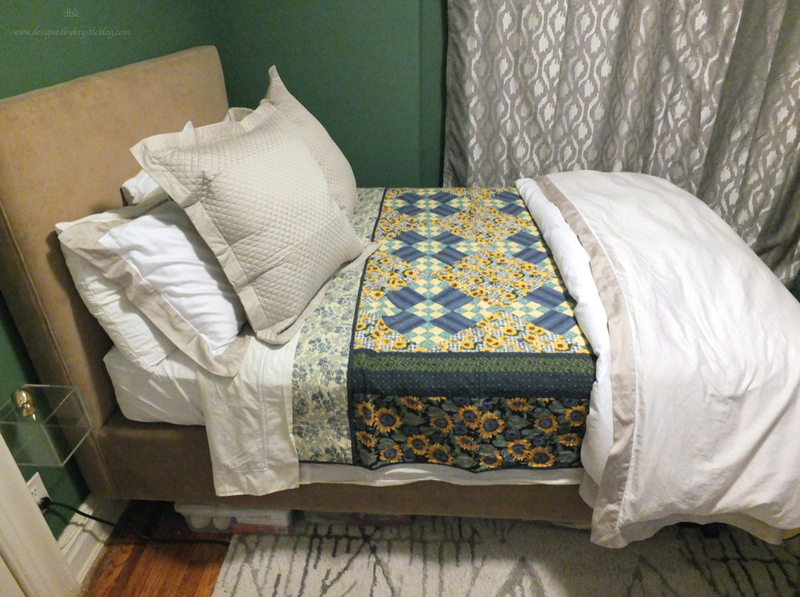 I change the sheets and the shams, keeping a good balance between the colors and textures by adding the quilted euro shams and a thin quilted layer, a favorite made by my mom. It is reversible and the sunflower side is perfect for the fall, not to mention that the blues and greens work perfectly in our bedroom color scheme. I keep the plush down comforter with the crisp white and greige cover folded at the end of the beds for when the nights get a bit too chilly and you need to pull up another layer to keep cozy. This bed is so cozy and inviting that I never want to leave it in the morning to go to work!! How do you transition your linens in the fall? Do you add more cozy and quilted layers like we do, or maybe switch up the color of your sheets or duvet cover? I always love to see and hear what others are doing to keep cozy as the seasons change and the temps begin to drop. 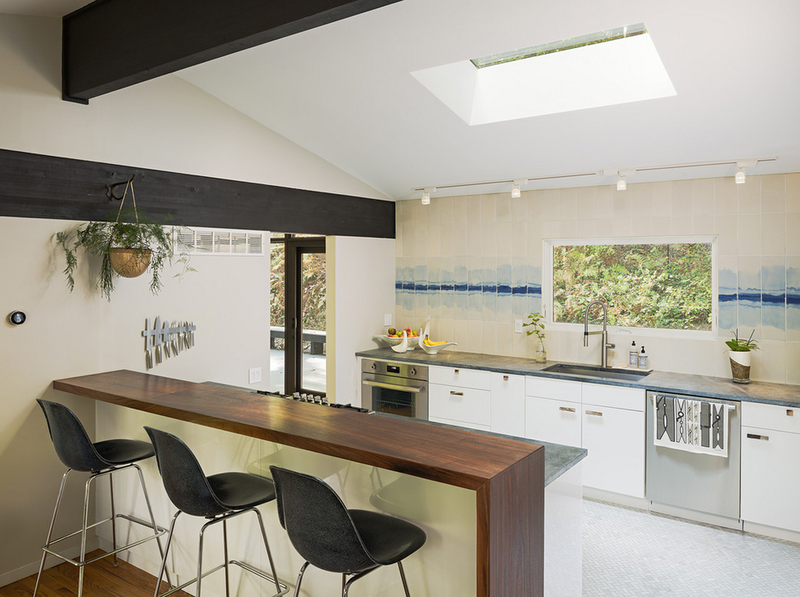 Shorewood Kitchen by Northland Woodworks Inc.
Victorian Eco-Historical Kitchen by Feldman Architecture, Inc.
Eagle Island Kitchen by Joseph Mosey Architecture, Inc. So, what do you think? Would you be inclined to use more color in your tile choices for your next renovations? I have to say, I do love a clean white kitchen, but after looking at all of the stunning shades of blue and the varying options, I think I might need to find some clients who would love a more colorful selection in their kitchen tiles. I’m feeling inspired!! Be sure to follow me on Houzz, Facebook, Twitter, Instagram & Bloglovin’ so you don’t miss out on any of my daily musings and inspirations! Today is apparently National Pink Day. I found out while scrolling through my Instagram feed, and being the true lover of pink that I am, I just couldn’t let this one slide. So I thought I would quickly share some of my favorite pink paints across the board in honor of this day. Farrow & Ball’s Cinder Rose. The manufacturer I specify the most in my projects is Benjamin Moore and they have a vast array of pinks to choose from. That said, I have a few favorites: Peony (2079-30) is a vibrant raspberry shade of pink, while Tickled Pink (2002-50) has more of a refreshing pink lemonade feel to it. Both are lovely, the Peony could be used in a small space to make a statement, and the Tickled Pink would be well suited in a little girls room or a guest room. Lastly, Sherwin Williams is another mainstream paint manufacturer that has a lot of great shades and tones, where you are sure to find exactly what you are looking for. The pinks I selected from them are a bit more orange in their base, first with Dishy Coral (6598), which is very cheerful and warm, I could see this color in a lot of places. Similar to BM’s Peony, it could act as a surprising bold in a small space such as a powder room, mud room or laundry space, but I can also see it adding a great pop by way of a graphic detail in a master suite space. The last pink I’ve selected is Oleander (6603), which is a very soft fleshy pink that, similarly to F&B’s Calamine, could really be used anywhere. Though it reads a bit more pink, it is soft enough to still feel neutral. Try a color like this on your ceiling to bring the eye up. What are your favorite shades of pink? Do you have a favorite manufacturer or distributor that you like to work with? Happy National Pink Day–hope you made it a pretty one! This season I have made a point to get out more. We have hiked, walked and wandered quite a bit, and through it all we have taken some pictures. 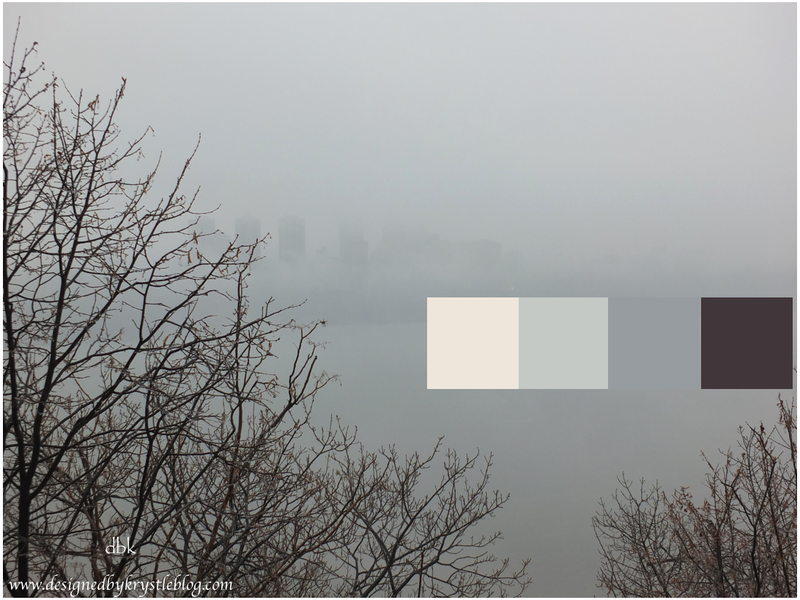 I took one of the scenes from our hike a few weeks back and put in some Farrow & Ball paint colors that create a lovely neutral color scheme that could be implemented in your home or wardrobe year round! Are you a fan of these winter neutrals? The inset colors from left to right are: Blackened, Skylight, Plummett and Mahogany. Soon spring will be upon us, and we can bring some brighter colors into the schemes. The last (and only) room reveal I posted from our new condo was our bold kitchen. Our living room flows smoothly in the same tradition, using a bold wall color in combination with large neutral pieces to balance the space. Our favorite elements of the living room are the cozy couch and rustic/industrial coffee table. Of course, I love those leather chairs, and the gallery wall is something that always makes me smile. My least favorite element is probably the bar cart. Even though I am the one that gave it the facelift before, I think the colors are too much for the space now and would fit better in a solid neutral or metallic tone, and I would love to find the old Lucite wheels to put back on it. What do you think? Is there a particular element that you love or live without? What is your favorite element of your living room? At long last, here is a look at our kitchen, and those bold pink stripes. Upon entering the condo, the kitchen is the first full room that you see, so we decided to add a splash of bold color right when you open the door to draw you in. The dining room table is a hand-me-down from P’s parents from their first condo and the chairs are from our old place in Connecticut. The whole dining set is a little large for our small galley style kitchen, but we made it work. The drop leaf table is essential in a small space as we can keep it down when it’s just the two of us eating, or working in the kitchen, and we can pop up the sides when we have guests over. When you are dealing with a small space, every inch of storage is precious. In our kitchen that means utilizing the space over the cabinets to keep serving pieces, vases, etc., that we don’t use every day and look nice enough to be out, without letting them take up valuable counter space or shelf space. We also added much needed surface space with a little bar cart from IKEA. The shelves add a great place for serving pieces and cutting boards, etc., while the top acts as a little drink station for the Keurig and soda stream. The bold colors, mixed with the rhino book ends to hold up the cook books, and the touch of pink on that little pipe add just the right amount of whimsy to the space. Our kitchen is now a happy little place where we can cook and entertain guests. Wouldn’t you agree?